Grey skies and on-and-off rain threatened as the first performances of SappyFest 11 (becoming a "SoggyFest," if you will) took place at the Mainstage Tent on Bridge Street. 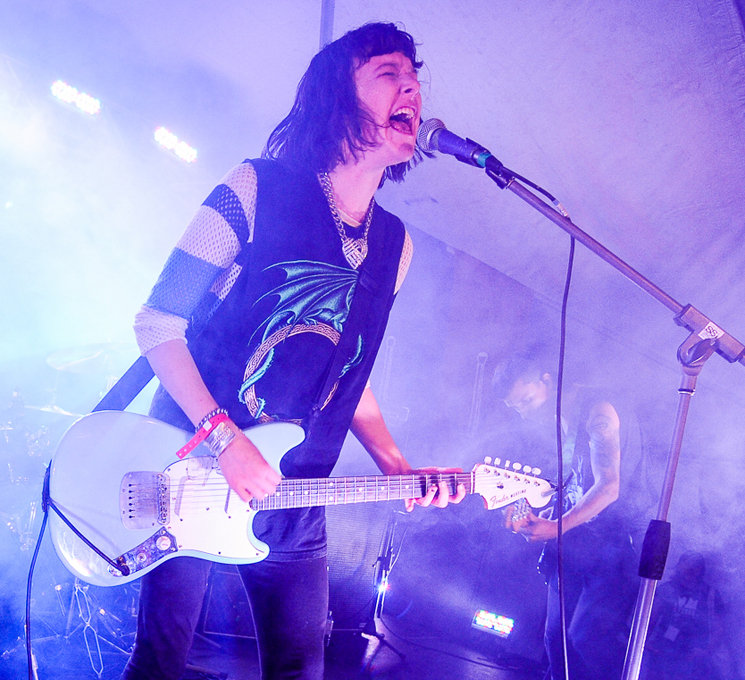 Luckily things cleared by the time Toronto's grungy punks Dilly Dally hit the stage. "More vocal, more guitar, please… I want it all, you know," Katie Monks cheekily said to the sound engineer before going into the gnarly "Ballin' Chain" (which she was sporting her own version of — a big heart-shaped, sparkling necklace that was reminiscent of the artwork on their debut, Sore). With candy hues of pink and purple lights illuminating the tent, Dilly Dally made their way through their 45 minute set, easily the heaviest that day one of Sappy had to offer. While "Snake Head" and "Green" ruled, their absurdly creative take on Drake's "Know Yourself" (a real cover from hell) brought a taste of Toronto to this sleepy town, while "Purple Rage" really struck a chord with the audience. "Sup? I understand why people do that when they're up here, ask what's up. We're all buddies… it's fucked," said Monks. Scream Queen Katie is a real treat to watch, astonishing with those vocals that seem impossible escaping from her throat, preaching to East coasters to use more profanity, while charming with the little smiles that she sneaks in during the performance. "The Touch" really put Monks' vocals on display — her voice cracking, straining and stretched until it barely resembled a voice at all, her hair sticking to her face and eyes rolling back into her head. The rest of the band really brought it, too, particularly on their 2014 release "Alexander," which hit oh so hard, with bassist Jimmy Tony really bringing it with that marvellous bass line. "Gender Role" was fantastic, with Monks screaming wildly and passionately piercing all the audience's ears. She's a terror bursting with desire. Speaking of desire, Dilly Dally rang in the night with their song of the same name, with everyone sporting a fine layer of sweat in the now very muggy tent.